Jeff Maren’s tennis career began with a loss to his mom. During the summer before his freshman year of high school, Maren was challenged to a tennis match by his mother, who was a former tennis player. Much to his surprise, she easily defeated him, which sparked an ambition for the sport inside of him. 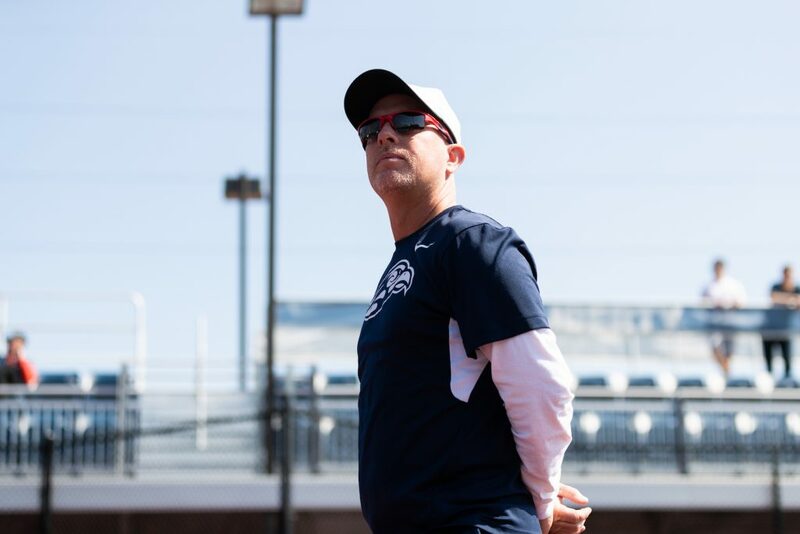 Since the day his mother humbled him on the court, Maren, the head coach of the Liberty women’s tennis team, has passionately pursued the sport of tennis. Whether he was crafting his personal game or teaching a younger player, tennis has been Maren’s outlet to live out his purpose in life. “(Coaching tennis) is definitely my mission in life,” Maren said. After the loss to his mother, Maren began tennis lessons and quickly learned how to play and began to hone his skills. By the end of that summer he was playing in competitive tournaments and winning matches. Typically, elite collegiate tennis prospects begin playing at a very young age and develop their talent over years of training and practice. Even with the late start to his playing career, Maren’s devotion led to success on the court in high school. The Kentucky native played three years of junior tennis tournaments and earned a scholarship to play at Thomas More College, a nationally-ranked NAIA school. Maren had success at Thomas More, finishing with a record of 81-20 in singles matches and competing in the NAIA national tournament in all four of his years at the school. Despite his achievements on the court, Maren, who studied business administration and psychology, had little expectation of being involved with tennis in the future. In his senior year at Thomas More, Maren got a job in the business world, but did not enjoy it. During that year, Terry Connor, the program’s athletic director at the time, approached him and asked if he would like to help start the women’s tennis program at the college. Just like that Maren found himself involved with the sport he loved and coaching for the first time in his life. Maren led the women’s tennis team to a 19-17 record in three seasons as the coach and helped build the program to become competitive at the NCAA Division II level. After he left Thomas More, Maren started another tennis program at Brescia University and coached there for five seasons, leading the men’s team to a 44-38 record. He left coaching for several years in the mid-1990s and started to focus on his job as a tennis pro and manager of several tennis clubs. Teaching the sport to others allowed him to rekindle the passion he had for guiding younger players. Maren became a United States Professional Tennis Association certified instructor in 1997. In 2005, he was named the “Kentucky Pro of the Year” by the USTA. While he was having success and making a great living, Maren said his job as a tennis pro was not completely fulfilling. 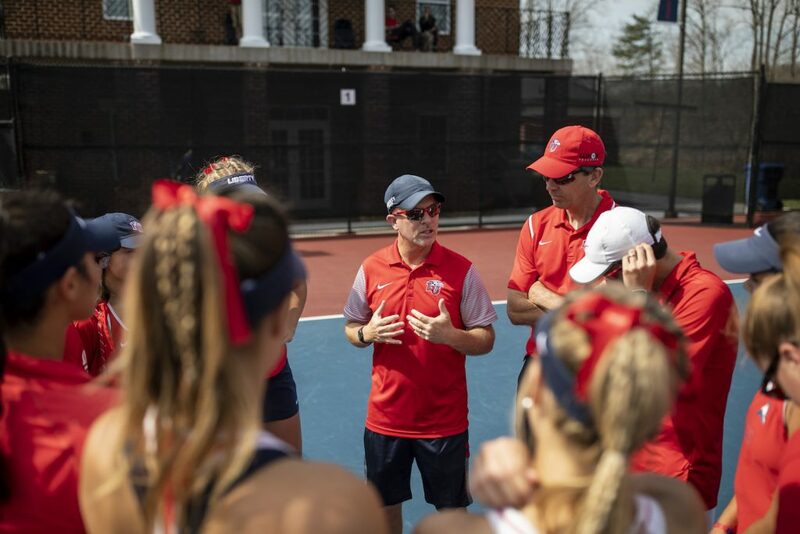 EXCELLENCE — Liberty women’s tennis has a 72-47 record with Maren as head coach. In 2007, an opportunity opened up for Maren to become an assistant coach for the women’s tennis team at the University of North Texas. The Mean Green had a record of 2-17 in the year before he arrived and just three players on its roster. Maren once again had the chance to rebuild. The team went 13-9 in his first season at North Texas, an 11-win improvement from the previous season. After three seasons of being an assistant, Maren was promoted to associate head coach. He helped lead the team to the school’s first Sun Belt Conference Championship in 2010, and then a second one in 2012. Maren gained valuable coaching experience in his six seasons with the Mean Green, but he said the most important lesson for him came in the early stages of the rebuilding process. During the summer of 2012, Maren was at the University of Houston interviewing for their women’s tennis head coaching position when he got a phone call from then-Liberty Athletic Director Jeff Barber. Barber told Maren to finish his interviews at Houston and then get on the first flight to Lynchburg. Maren was hired as the coach shortly after his interview with Barber and immediately began planning for what he wanted the women’s tennis program to look like. Since he arrived in 2012, Maren has helped the women’s tennis program to reach new heights. The team either reached the Big South semifinals or finals in each of his first six seasons, and he led the team to a program-record 19 wins in 2015. Despite the accolades, Maren has yet to achieve his goal of leading the team to a conference championship. The Lady Flames have come up just short several times in his tenure, narrowly losing in the championship match on more than one occasion. 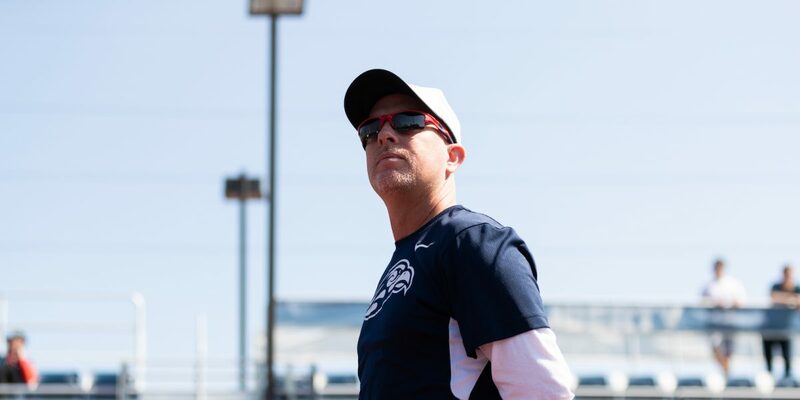 IDENTITY — Coach Jeff Maren encourages his players to keep their identity separate from tennis. Through the losses, Maren said he has learned a lot and is a better man and coach for having fallen short as the team has in prior seasons. For Maren, the most important thing is not winning, but coming alongside the athletes as they transition from being teenagers to young women. His desire is to see the players develop holistically, not only athletically. Maren said pouring into the players and seeing them grow is better than winning a match or teaching them how to hit a better serve. Tennis is only the medium through which he does his ministry. At the same time, Maren loves tennis and he has ever since that summer day when his ego took a hit and his motivation took off. That was a heart warming story from beginning to the final line. I am proud of what you have done to bring success to Liberty . The Lord has truly blessed you with your career . You are a great family man as well as a great coach!